Just about a week and a half ago, we were having some seriously cold winter weather. Like zero degrees. That is way too cold for me! And apparently for lots of other people, because no one wanted to get out in that weather. We were kind of all hibernating during that deep freeze. And then, much to everyone’s delight, the weather gradually started warming up. Things slowly came back to life. It felt like the frozen world was beginning to thaw. And as that happened, I started craving a good salad. In a medium glass jar with fitted lid, whisk together the vinegar, lemon juice and oil until well blended and season to taste with salt and pepper. Cover and set aside (you can skip these steps if you’re using a raspberry-walnut vinaigrette). In a large bowl, toss together mixed greens, chopped apple, walnuts and cheese. Just before serving, toss with just enough dressing to coat the lettuce (you may have some dressing left over). Season to taste with salt and pepper. This is a great winter salad, and the chopped apples, walnuts, and Stilton cheese go really well together. Do you have a favorite winter salad recipe? Sharing at Inspire Me Monday, Happiness is Homemade, Meal Plan Monday, Fiesta Friday, Thursday Favorite Things, Full Plate Thursday. This entry was posted in Food and Recipes, Healthy Eating, Salads and Dressings and tagged Apple Walnut Salad, blue cheese, Stilton Cheese on January 25, 2018 by nancyc. This is a good recipe for summer, if you want to have a snack with fresh veggies. It’s good with crackers or chips, too. And it would also be yummy with something spicy like buffalo chicken wings. It’s super quick and easy to make and if you have time, you’ll want to make it a day ahead and store it in the refrigerator until you’re ready to serve it–for some reason, this dip seems to taste better when made ahead! Optional: salt and pepper to taste; you can also add in some garlic or onion powder too, if you like! In medium size bowl, mix blue cheese crumbles with plain Greek yogurt or sour cream. Add in the lemon juice and mayonnaise, blending everything well. Add salt and pepper to taste, if desired. Spoon mixture into serving bowl and serve or cover and refrigerate until ready to serve–it tastes best if you make it the day before serving it! Serve with crackers, veggies, or chips. Also tastes great with spicy foods like Buffalo Chicken Wings! So are you a fan of blue cheese too? Do you have a favorite blue cheese recipe? Linked to Fiesta Friday, Weekend Potluck, Inspire Me Monday, Full Plate Thursday, Create It Thursday, Thursday Favorite Things, Show and Share. 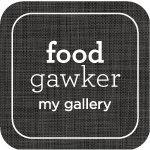 This entry was posted in Appetizers/Snacks, Food and Recipes, Spreads and Dips, Vegetables and tagged blue cheese, Blue Cheese Dip, Creamy Dip on May 13, 2016 by nancyc. 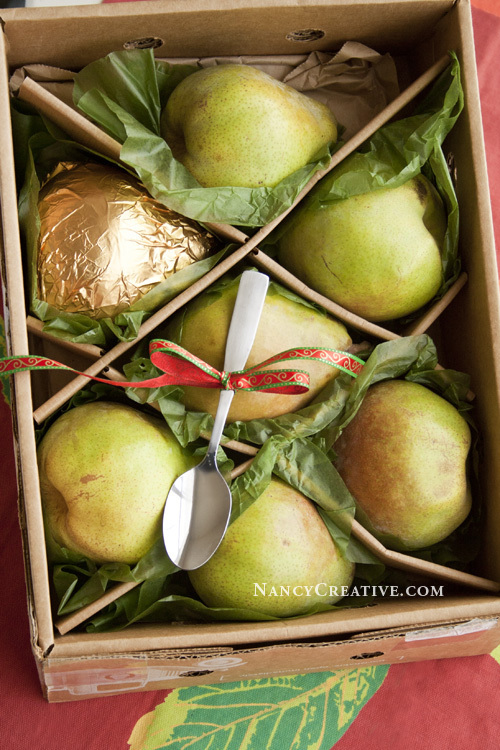 A few days ago, I found a nice surprise on my doorstep–a box of beautiful Harry & David® Royal Riviera® Pears! And Harry & David® is also extending a special offer to me and my readers–a 20% discount on your next purchase of anything on their site when you enter the code NANCY20 during checkout! So if you still need some gifts, you’ll want to check out their site! I learned a little about the history of these pears, too. These sweet and juicy pears, traced back to 19th century France, were brought to Oregon’s Rogue Valley in 1897, where they thrived in the climate there. And for 80 years Harry & David® have been shipping these pears from their southern Oregon orchards. I was wondering why there was a spoon in the package, and then I saw a note explaining that, in celebration of Harry & David’s® 80th anniversary, and also in honor of National Pear Month (yes, December is National Pear Month!) they were inviting some pear lovers to take the “Spoon Test Challenge” to see if their claim that Royal Riviera® Pears are really “so big and juicy, you can eat them with a spoon” is true. So I did take the Spoon Test Challenge, which involved letting the pears ripen for 1-2 days, slicing them in half, and using a spoon to eat the juicy pear. And I am happy to verify that yes, these pears really are juicy enough to eat with a spoon! They are really, really good. If you like pears or know someone who does, these are a real treat! Here’s a recipe for a salad you can try–this recipe was included in my package of pears, so I thought I’d share it with you. This would make a great salad for your holiday meal! You can also find more salad recipes at Harry & David.com. Whisk together the first 5 ingredients. Gradually whisk in the walnut oil. chill for 20 minutes. Gently tear the lettuce into bite sized pieces. Arrange on four chilled plates. Top with fans of pear slices. 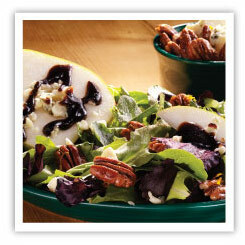 Sprinkle blue cheese evenly over the pears and lettuce and top with nuts. Drizzle the dressing generously over the salad and serve. Are you a pear-lover, too? What kinds of recipes do you like to use pears in? This entry was posted in Food and Recipes, Food Gifts, Healthy Eating, Salads and Dressings and tagged blue cheese, Harry & David®, Pear Salad, pecans, Royal Riviera® Pears, walnuts on December 16, 2014 by nancyc. I took a short break from the internet at the end of August, and I can’t believe we are into September already! But it’s still officially summer and the weather is still warm for many of us, so I thought I’d post a recipe for a fruity, cheesy salad. Salads make great light lunches on hot, humid days and it’s even more convenient when you can make them ahead of time for work or just to have handy at home. 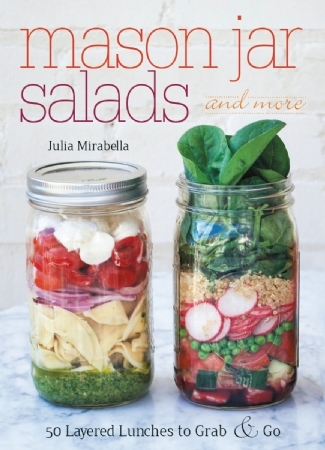 I found lots of great grab-and-go ideas in Mason Jar Salads and More by Julia Mirabella. The salads are made by layering the ingredients vertically in Mason jars (the dressing usually goes on the bottom–this salad is an exception). In addition to recipes for salad lunches, the book includes some breakfast smoothies and oatmeal you can make-and-take in mason jars, as well as other healthy lunch options that include pasta and rice. There are some snack ideas, too, and lots of great homemade vinaigrettes to try out. I decided to make the Spinach, Blueberry, and Blue Cheese Salad and instead of using the Red Wine Vinaigrette that the original recipe calls for, I made the Blueberry Vinaigrette. I thought the blueberry-spinach combination was really good, and I loved the taste of blue cheese with it, too. 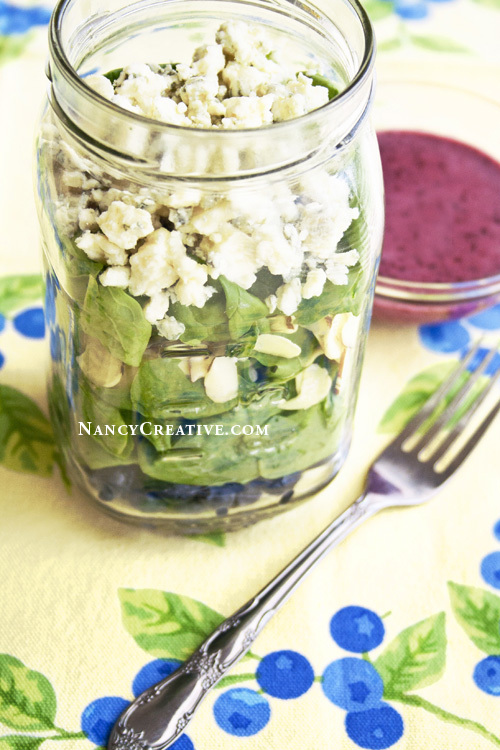 The Blueberry Vinaigrette was great on this salad–it added even more blueberry flavor. If you like fruit and cheese, this salad is a great way to enjoy those mix of flavors. Some of you may not be crazy about blue cheese, so if that’s the case, you could try substituting feta cheese. This is a really easy salad to put together–hope you enjoy it! Place the blueberries, vinegar, honey, salt, and pepper in a blender and blend until smooth. With the blender running, slowly add the olive oil until it is the right consistency. On top of the blue cheese, make a parchment paper cup (cut a square of parchment paper to an 8×8″ size; place it over the jar and push down to form a little cup). The edges of the parchment paper should extend beyond the edge of the jar; bend edges downward over the outside of the jar. Pour the vinaigrette into the parchment paper cup and twist on the lid, making sure it is tight. Refrigerate until ready to eat and mix the vinaigrette in with the other ingredients in your salad. Note: !f you’re going to eat this salad on the same day you make it, you can put the dressing in the bottom of the jar and eliminate the parchment paper cup. Otherwise, the salad will last longer if the blueberries don’t sit in the dressing. I love using fresh fruit in salads–it adds so much extra flavor! What fruits do you like using in your salads? This entry was posted in Food and Recipes, Healthy Eating, Reviews, Salads and Dressings, Seasonal, Summer/Summer Holidays and tagged blue cheese, blue cheese salad, blueberries, blueberry, featured, fresh blueberries, fresh spinach, mason jar, mason jar salad, salad, spinach on September 6, 2014 by nancyc.